The Swales Mattress Trolley has been designed to carry high-quality pressure ulcer prevention mattresses between wards. 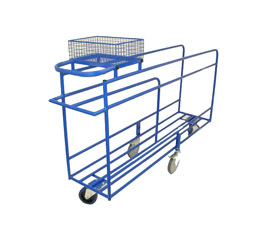 In an article published in a NHS Staff Matters newsletter, the trolley is praised as simple to use and easily operated by one person, saving time and manpower. The trolley is highly manoeuvrable on front and rear steering castors, with centrally fixed braked wheels on which the trolley pivots. The trolley also has a fixed basket for storing bed pumps and cables for inflatable mattresses and has the capacity to carry and store two mattresses. The mattress trolley is also available to carry 3 or 4 mattresses at any one time please advise which you require at time of order.